Steiner, a trusted name in the area of hunting and tactical optics continuously introduces new optical innovations to their rifle scope offerings. These range from new scopes for military to tactical and hunting applications. 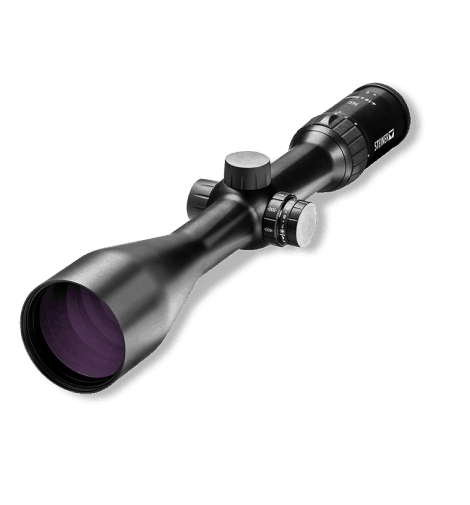 The M6Xi 1-6x24 is a new addition to the M Series scopes. The M indicates in Steiner’s product lines that it is a scope that is supposed to be used for military applications. Yet, there’s no reason not to have a closer look at this scope if you’re interested in a scope for hunting or tactical use. The scope is designed to provide fast target acquisition and a crystal-clear image whether you’re in the brush or on the streets. It’s usable for pretty much any kind of application. The M6Xi features a 1-6x magnification range. The tube features a 30mm diameter and the scope comes with Steiner’s illuminated Rapid Dot reticle. The field of view at 100 yards is 118.1 feet to 23.7 feet depending on the selected magnification. The reticle is positions on the 2nd focal plane. It provides aiming points for both 5.56 and 7.62 caliber rifles to provide shooters fast and easy targeting. The illuminated reticle offers 11 different illumination settings. 7 of these are intended for night use and 4 for the day. At each end of the dial you can find an Off position to switch the illumination off. Between each setting you can also find quick standby levels that put the scope into a standby state while allowing you to return instantly to your previous setting. The glass components of the scope are made from crystal clear glass and multi-coated to prevent light reflection. Windage and Elevation turrets offer precise adjustments. The scope is designed and made in Germany. Windage can be adjusted by 16 mils and elevation adjustment ranges across 32 mils with 0.1 mrad clicks. The eye relief is 3.5 – 4.3 inches. 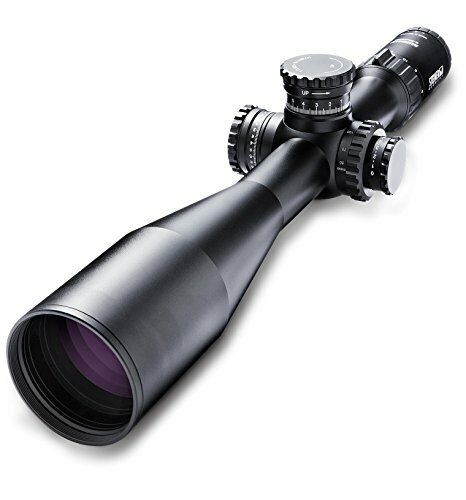 It weighs 22 ounces making it a lightweight scope that is durable and rugged. The length comes in at 11.25 inches. The scope is nitrogen purged and is waterproof and fogproof. It can be submerged up to 33 feet (10 meters) and offers a fixed parallax. Another new introduction by Steiner is their new Multipurpose Sniper Reticle (MSR2) that is exclusively developed for Steiner together with FinnAccuracy. The main improvements compared to the MSR reticle are gradual enhancements with regards to target acquisition in low, mid and full magnification settings. The new reticle is currently exclusively available on the M5Xi 5-25x56 sniper scope. It German made and built to strict military specifications. You can rely on the scopes to perform in even the harshest conditions. The reticle sits on the 1st focal plane and the scope provides a 5-25x magnification range with a 56mm lens and a 34mm tube. This setup provides excellent optical performance in any lighting situation. The reticle center is illuminated and uses the latest lend etching technology. This ensures precise setup with slimmer lines to provide the shooter improved visibility of the target at high magnification levels. All M5Xi rifle scopes are waterproof, fog proof and shockproof. They are rated shockproof up to 900G allowing for use on rifles with heavy recoil and provide durability in harsh conditions. Windage adjustment ranges across 6 mils while elevation can be adjusted over 26 mils in 0.1 mrad clicks. Parallax is adjustable on the scope and ranges from 164ft to infinity. The scopes weighs in at 36.3 oz and measures 16.6 inches in length. The T-series of Steiner rifle scopes is designed to be used for tactical environments. Steiner added their popular Special Competition Reticle (SCR) with MOA adjustments to the T5Xi 3-15x50 and 5-25x56 models. Both models feature a massive 34mm tube and large lenses to provide excellent clarity and low-light performance. The scopes are designed for rough use and are rugged and dependable. The illuminated reticle is on the first focal plane. It’s an etched glass reticle with center part illumination. Adjustments can be made in ¼ MOA clicks. The illumination brightness can be adjusted in 7 levels for night use and 4 levels for day use. The scopes feature low-profile turrets that are resettable. A Steiner exclusive is the Second Rotation Indicator. It shows each mil or elevation through an indicator window on the elevation turret. The numbers on the scale change after each ¼ MOA rotation. This adds additional information for the shooter and prevents from getting lost in the dialing process. The scopes are nitrogen filled to prevent fogging and are waterproof down to 33 feet. Parallax settings range from 50 feet to infinity on the 5-25x56 and 25 ft to infinity on the 3-15x50 scope. Windage and Elevation ranges on both scopes are impressive. The 3-15x50 variant offers windage range of 54 MOA and an elevation range of 120 MOA in ¼ MOA clicks. The 5-25x56 scope provides the same windage range and an elevation range of 90 MOA. Another addition to the Steiner rifle scope offerings are the H4Xi scopes that are specifically designed for hunting. They offer low-light capabilities that are hard to match with other scopes. The H4Xi series at this time features two scopes. The 3-12x56 on the one hand and the 4-16x56 as the second choice. Both scopes are made in the US and feature Steiner’s Plex S1 reticle. The reticle sits on the 2nd focal plane. It comes with an illuminated center that can be adjusted in 11 settings for optimal performance in any surrounding light condition. The main tube is a single-piece 30 mm tube with a massive 56mm lens to provide an industry leading 96% light transmission. These features provide vivid images with high contrast and high resolution even in challenging low-light conditions. The scopes feature a 4x zoom system and are a good match for pretty much any hunting rifle. MOA Windage and elevation turrets are low profile and the illumination dial and side-adjust parallax are easily accessible. Elevation and windage can be adjusted in ¼ MOA increments within 33 inches at 100 m.
The scopes interior is nitrogen filled to prevent internal fogging. As with all Steiner scopes, they are built rugged and are dependable. They are waterproof and can be submerged in water down to 6.5 feet. Both scopes come in at a weight of 25 oz. The length of the 3-12 is 13.2 inches and the 4-16 option measures 14.5 inches in length. All Steiner optics come with the industry leading Steiner Heritage Warranty which promises highest standards of quality, dependability and customer satisfaction.